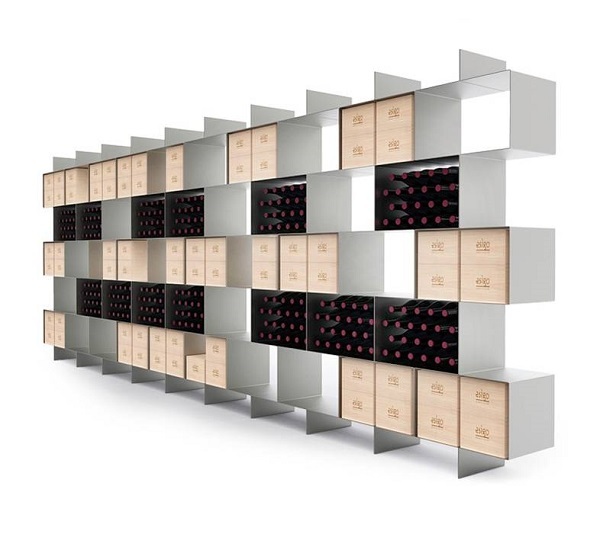 Esigo 2 Box, the contemporary wine rack which can be wall-mounted or used as a central room wine bottles display unit, designed to be a rack for wine cases and to contain boxes and bottles of wine. The capacity of 240 bottles per 113 cm wide module makes it the metal wine rack and the rack for wine crates storage that optimises space. Thanks to its extensive container capacity with a neat and contemporary design, it's ideal to furnish wine cellars, wine bars, wine shops, wineries tasting rooms and retail shops.